On August 3, the Senate Foreign Relations Committee cleared the executive nominations of the following State Department nominees. The Committee also cleared nominees for USAID, BBG, ADB and OPIC. The nominations now go to the full Senate for a vote. a Career Member of the Senior Foreign Service, Class of Minister-Counselor, to be Ambassador Extraordinary and Plenipotentiary of the United States of America to the Republic of Peru. a Career Member of the Senior Foreign Service, Class of Minister-Counselor, to be Ambassador Extraordinary and Plenipotentiary of the United States of America to the Republic of Iceland. a Career Member of the Senior Foreign Service, Class of Minister-Counselor, to be Ambassador Extraordinary and Plenipotentiary of the United States of America to the Republic of Cote d’Ivoire. a Career Member of the Senior Foreign Service, Class of Minister-Counselor, to be Ambassador Extraordinary and Plenipotentiary of the United States of America to the Republic of Yemen. a Career Member of the Senior Foreign Service, Class of Minister-Counselor, to be Ambassador Extraordinary and Plenipotentiary of the United States of America to the Republic of Colombia. a Career Member of the Senior Foreign Service, Class of Counselor, to be Ambassador Extraordinary and Plenipotentiary of the United States of America to the Republic of Palau. a Career Member of the Senior Foreign Service, Class of Minister-Counselor, to be Ambassador Extraordinary and Plenipotentiary of the United States of America to Bosnia and Herzegovina. a Career Member of the Senior Foreign Service, Class of Minister-Counselor, to be Ambassador Extraordinary and Plenipotentiary of the United States of America to the Republic of the Congo. a Career Member of the Senior Foreign Service, Class of Counselor, to be Ambassador Extraordinary and Plenipotentiary of the United States of America to the Republic of Zambia. a Career Member of the Senior Foreign Service, Class of Minister-Counselor, to be Ambassador Extraordinary and Plenipotentiary of the United States of America to Burkina Faso. a Career Member of the Senior Foreign Service, Class of Counselor, to be Ambassador Extraordinary and Plenipotentiary of the United States of America to the Gabonese Republic, and to serve concurrently and without additional compensation as Ambassador Extraordinary and Plenipotentiary of the United States of America to the Democratic Republic of Sao Tome and Principe. a Career Member of the Senior Foreign Service, Class of Minister-Counselor, to be Ambassador Extraordinary and Plenipotentiary of the United States of America to the Republic of Lebanon. a Career Member of the Senior Foreign Service, Class of Minister-Counselor, to be Ambassador Extraordinary and Plenipotentiary of the United States of America to Greece. a Career Member of the Senior Foreign Service, Class of Minister-Counselor, to be Ambassador Extraordinary and Plenipotentiary of the United States of America to the Democratic Republic of the Congo. a Career Member of the Senior Foreign Service, Class of Minister-Counselor, to be Ambassador Extraordinary and Plenipotentiary of the United States of America to the Central African Republic. a Career Member of the Senior Foreign Service, Class of Minister-Counselor, to be Ambassador Extraordinary and Plenipotentiary of the United States of America to the Democratic Republic of Timor-Leste. a Career Member of the Senior Foreign Service, Class of Counselor, to be Ambassador Extraordinary and Plenipotentiary of the United States of America to the Republic of Sierra Leone. a Career Member of the Senior Foreign Service, Class of Career Minister, to be Ambassador Extraordinary and Plenipotentiary of the United States of America to the Republic of Iraq. a Career Member of the Senior Foreign Service, Class of Minister-Counselor, to be Ambassador Extraordinary and Plenipotentiary of the United States of America to the Republic of Chile. a Career Member of the Senior Foreign Service, Class of Minister-Counselor, to be Ambassador Extraordinary and Plenipotentiary of the United States of America to the Republic of Indonesia. a Career Member of the Senior Foreign Service, Class of Minister-Counselor, to be Ambassador Extraordinary and Plenipotentiary of the United States of America to the Federal Republic of Nigeria. a Career Member of the Senior Foreign Service, Class of Career Minister, to be Ambassador Extraordinary and Plenipotentiary of the United States of America to Jamaica. a Career Member of the Senior Foreign Service, Class of Minister-Counselor, to be Ambassador Extraordinary and Plenipotentiary of the United States of America to the Kingdom of Lesotho. a Career Member of the Senior Foreign Service, Class of Minister-Counselor, to be Ambassador Extraordinary and Plenipotentiary of the United States of America to Malaysia. a Career Member of the Senior Foreign Service, Class of Minister-Counselor, to be Ambassador Extraordinary and Plenipotentiary of the United States of America to the Republic of Panama. and Plenipotentiary of the United States of America to the Republic of Turkey. As reported here, the nomination of Matthew J. Bryza to be Ambassador to Azerbaijan did not make it out of Committee and is reportedly not expected to be taken up until after recess. Three nominations reported favorably by the SFRC on April 13, 2010 are still waiting for a full Senate vote. a Career Member of the Senior Foreign Service, Class of Counselor, to be Ambassador Extraordinary and Plenipotentiary of the United States of America to the Republic of Niger. * 810 1221 Raul Yzaguirre, of Maryland, to be Ambassador Extraordinary and Plenipotentiary of the United States of America to the Dominican Republic. a Career Member of the Senior Foreign Service, Class of Minister-Counselor, to be Ambassador Extraordinary and Plenipotentiary of the United States of America to the Syrian Arab Republic. One nomination reported out of the SFRC on April 28, 2010 is also awaiting confirmation. * 831 1260 Mari Carmen Aponte, of the District of Columbia, to be Ambassador Extraordinary and Plenipotentiary of the United States of America to the Republic of El Salvador. 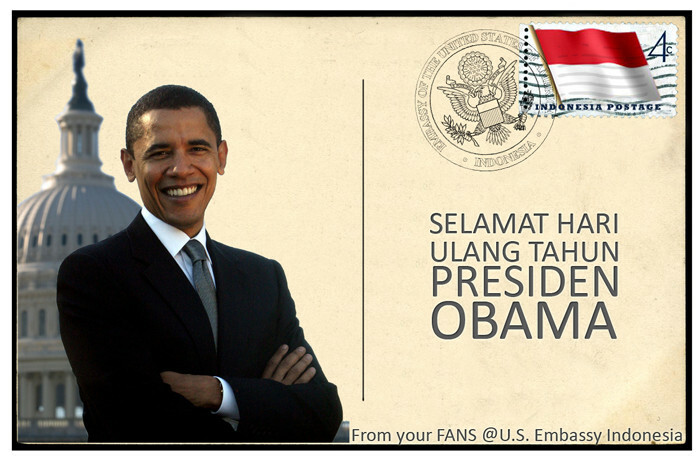 Fans@US Embassy Indonesia Greets President O "Selamat Ulang Tahun"
The new media team at US Embassy Jakarta remembers President Obama’s 49th birthday today and has put up a page for their fans to post birthday greetings. The page currently has over 600 greetings and counting. Last year, they did the FotObama Photo Contest to celebrate his 48th birthday.